Sometimes people make really unique strategy RPGs and name them after Queen songs. This is sort of one of those times. Ogre Battle 64: Person of Lordly Caliber, which is some days in contention for my favorite video game of all time, was the sequel to the early PlayStation/late SNES title Ogre Battle: March of the Black Queen. Both the name of the series (“Ogre Battle”) and the name of that game (“March of the Black Queen”) are Queen songs. 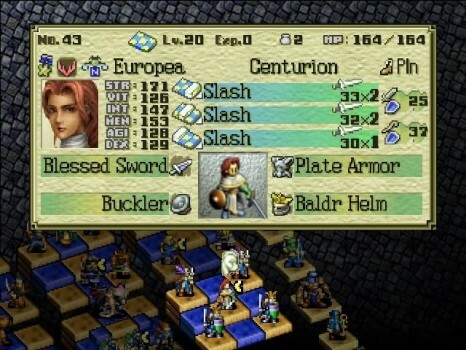 Tactics Ogre, the other PlayStation entry (and eventual PSP port, and predecessor to the better-known Final Fantasy Tactics), is named after a Queen song (“Let Us Cling Together”). “Person of Lordly Caliber” is not a Queen song. It’s actually kind of an odd title, to be frank. But, like, epic box art, amirite? 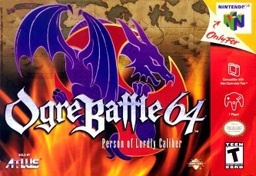 Though it was released after both of the PlayStation titles, Ogre Battle 64 occurs between them, the sixth chapter in what is theoretically an 8-chapter saga. (Chapters 1-4 and 8 have never come out, though there are a few other Ogre Battle games.) 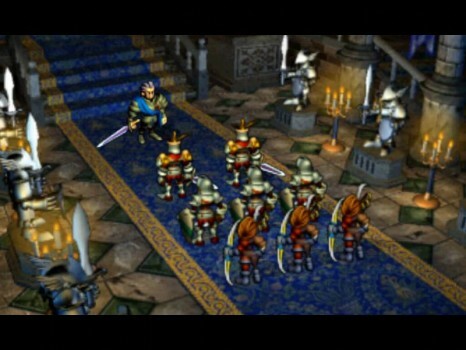 And though the best known of the series, Tactics Ogre, works in the now-familiar turn-based strategy RPG paradigm, Ogre Battle 64 and March of the Black Queen function in a fashion all their own. As ever, the game opens with a tarot-card based interrogation that determines a few things, like your character’s starting alignment and units. This is mildly important, though not so game-changing as most character creation. Your character is Magnus Gallant, a young captain in the army of the fantasy kingdom of Palatinus, which lies north of Zenobia, where March of the Black Queen takes place. Magnus is tasked with putting down what amounts to a slave rebellion, but after the first few missions finds himself drawn to the plight of the people. And so begins his career in the Revolutionary Army. The story is epic in scale and wonderfully told, for its time, with lots of little choices with long-lasting effects. If the setup lacks a certain originality, it makes up for it in execution: the game does not shy away from the immense grey area that Magnus and his cohorts encounter in their years-long war: the people they are ostensibly fighting for often get caught in the crossfire, so to speak. This isn’t an antiheroic deconstruction of the rebel army, but it’s not a heroic war of liberation, either, not exactly. It’s just a war. No one in Zeteginia has a mouth. Some grow beards to create the illusion of mouth-having. The cast is large and the machinations dramatic. Magnus’s allies include Diomedes Rangue, a fiery soldier of low birth, and his frequent foil, Leia Silvis, the daughter of a noble family. Scenes between missions further the story of Magnus’s childhood friend Prince Yumil, caught between his desire to do what is right for his people and the fact that those same people are mostly trying to overthrow the current social order, and Magnus’s father, Ankiseth Gallant, a decorated military leader. The political and religious plot starts thickening when the Holy Lodis Empire, which keeps Palatinus as a puppet state, decides that more attention to the revolutionary upstarts is needed. I’ll come back to why I absolutely gush over this story in a little while, but for the moment let me tell you about what I really adore about this game: the game part. 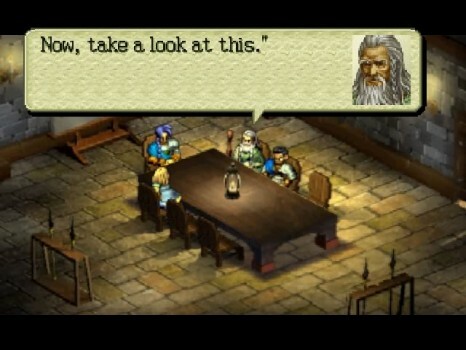 When most people think of SRPGs, they think of games like Tactics Ogre and Final Fantasy Tactics, or maybe, more recently, the Disgaea series, in which each mission involves deploying maybe half a dozen characters onto a battlefield and, in turn, moving, attacking, and using other special abilities. 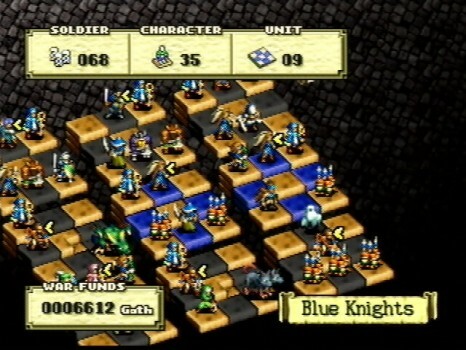 Ogre Battle 64 is not that by a long shot. Magnus’s army (which can get quite large) is split into units of up to five characters, laid out on a 3×3 grid. Unit design is the domain of the game’s most critical strategy, not the battlefield itself, and I’m the sort of player who can spend a lot of time trying to fine-tune such things. Each character belongs to a certain class, and each class gets certain numbers of types of attacks in each of the three rows of the unit grid. Melee-oriented classes, like Knights, tend to work best in the front row, while ranged and magical characters tend to work best in the back. At higher levels, the function of a unit can change entirely in different positions: the Paladin, a third-tier class, gets 3 melee attacks in the front row (which is very very good), but if placed in the back row uses healing magic to support the rest of the unit. Occasionally, putting two different characters adjacent to each other (like multiple spellcasters, even if they use different kinds of magic) will yield a surprising combo attack. All characters level up over time and, with the right equipment, can be made whatever class you want, though certain classes logically follow from others. In the earlier stages of the game, building your army is a critical part of your strategy: many of your recruits will be Soldiers, which are lame little dudes that come three to a character, but can become a Fighter or Amazon given a little XP. Soldiers become Fighters if they are in a group led by a male character, and Amazons if they are in a group led by a female character – and, yes, most classes are gender-dependent. So it takes a bit of planning ahead to get what you want in your army, and a little risk, since a unit with a Soldier in it basically has one whole character committed to being pretty much worthless in battle. Note the guys in the silly orange hats to the right. Yeah, the ones that aren’t helping. 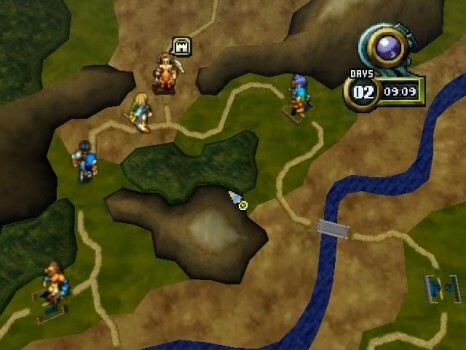 Speaking of battle: during missions, you have a bird’s-eye view of the map of the region, which covers several square miles and includes numerous towns that can be garrisoned to heal your troops and, in certain towns, buy provisions and things. Each of your units (you can have up to 10 deployed at a time, but your army can include more) is represented by whatever character you’ve elected as the leader of the unit. You give each unit marching orders and they move across the map in real time. When they encounter an enemy unit, battle ensues. Okay, so it’s not that pretty. It’s the freaking N64. 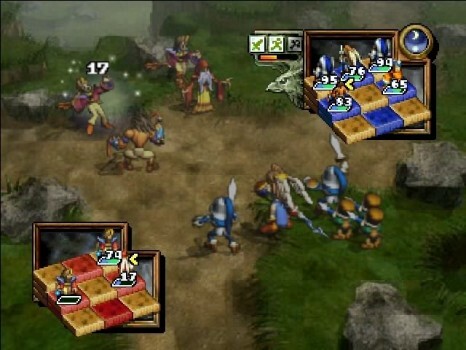 Characters in each unit act one at a time, and battle continues until each character has taken all of their allowed actions, depending on their placement in the unit. You can give a unit cursory instructions, like Attack the Leader or Attack the Weakest, but this is mostly hands-off and left up to how you’ve built and equipped the unit in the first place. The winner of the skirmish is whichever unit deals the most damage, and the loser is forced back a considerable distance on the map. Positioning becomes further important when you realize that flanked units fight with their layout rotated 90 degrees, so that whatever side the enemy is attacking on becomes the “front”, sometimes putting all your characters in the worst possible positions. Units attacked from behind are…well, you can figure that out. Each character has, like, lots of numbers and stuff. Of course, characters die, and it’s not cheap to bring them back. Though resurrection magic exists, it’s pretty expensive early on. Dead characters just stay dead, filling a spot in your army (though you can remove them from their unit) until you resurrect them…or until they become undead, which there is a chance of for each character who is dead when a battle ends. (As I learned first-hand once, even your main characters are not immune to this happening to them.) If a unit leader dies, you can no longer give that unit orders until you assign another, and not all character types can be leaders. Not all characters are human, either, and throughout the game you can recruit monsters that you encounter in the wild. 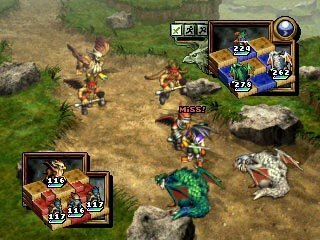 Dragons (which take two of your character slots in a unit) can be especially devastating when they get older, and other monsters have their own fiercely powerful attacks. Some classes, like the female Dragon Tamer, improve the abilities of monsters in their unit. Though you have less control over their advancement, they are powerful allies. I find your dragon placement…dubious. As Magnus and his army fight across Palatinus, they encounter numerous special characters who offer to join the fight. These characters are often slightly pumped up versions of normal classes, though sometimes they are unique (like the one werewolf guy, who is a swordsman by day and a werewolf by night), and some of them do take place in story scenes if they join you. (Some are very important.) The wrinkle is, acquiring these characters is no simple matter; many of them depend on earlier choices you made, or your current alignment, which is affected by stuff the game never really tells you about unless you look for it. Many of the characters are mutually exclusive. 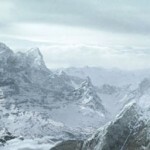 That’s not to say that you can go through the game and acquire none of them; far from it. Even blundering your way through Ogre Battle 64 will yield quite a few special characters. But some of the really special characters you kind of have to luck into (especially at the time: even the game’s player’s guide did not tell you how to get all the different characters, though now, of course, people have made websites to help). The same is true of special equipment; the game is littered with unique magical swords and axes and armors and other stuff, some of them very easy to acquire, others much, much harder. Somebody in this image is a potential traitor to Lodis. Part of doing so is liberating towns instead of capturing them. Each town has an alignment, and you want to garrison them with units of comparable alignment to “liberate” them. This is by no means necessary to beat the game, though if you don’t pay attention to it you’ll likely get one of the less-good of the six possible endings. Between battles you can also redeploy to a map to visit with the locals, and sometimes they will give you clues about where to find special stuff; sometimes not. Basically, there’s a lot of hidden stuff, and if you like digging for hidden stuff, this game won’t disappoint. If I have one complaint (and I do), it’s that this is one of those strategy games that pulls too many punches. The AI is not sufficiently aggressive to pose a challenge too often if you’ve arranged your units well, and seldom does the AI have the sort of deviously conceived units you can manage, even though it has access to all the same character types (and then some). There’s a level of randomness to attack accuracy and the like, of course, and sometimes you do run into ambushes or units that are just damn strong, but you can definitely be much better at this game than the game is. I still have my dusty N64 cartridge (and dusty N64) because I’m far too attached to my memories to let it go. I am led to understand that Ogre Battle 64 is not very common: I got it at release in 2000 and never had to look hard, but certainly now any given N64 game can be tricky to come by. Fortunately for all of you who should go play it right now, it hit the Wii Virtual Console two years ago. So what are you still doing here? Send a courier with a message to find the author on campaign at dix@tap-repeatedly.com! Wow, I did not know this game existed! Looks fun.